This entry was posted in Uncategorized on January 7, 2013 by luisrm02. Whats your favorite campfire classic? Here is one of ours. A campground classic kicked up a notch with Mantecado & S’Mores! Yummmm! 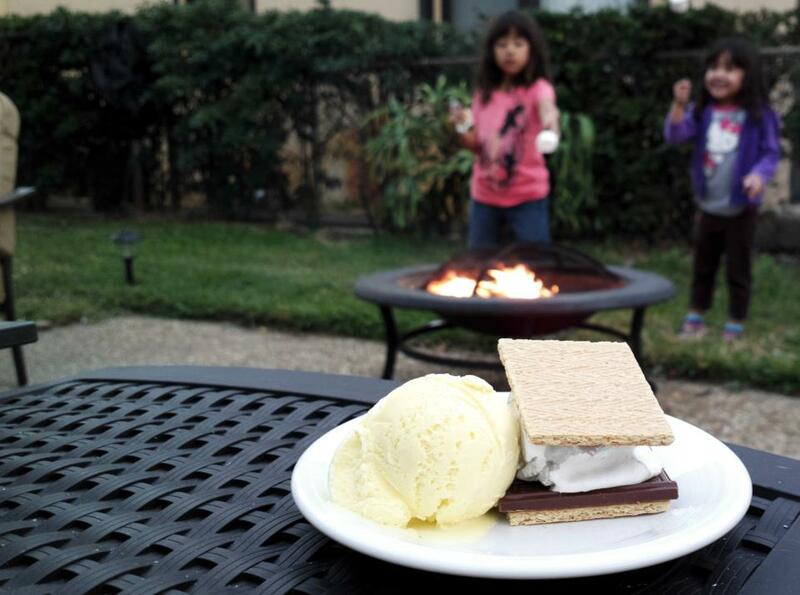 It doesn’t get any better then S’Mores and Mantecado Ice Cream! We grabbed a few kids, lit up the fire place, snagged all our ingredient and we were off to have some fun preparing some tasty treats. Start of with laying out the stack, preparing it for the gooey melted marshmallow. The kids absolutely loved being able to roast marshmallows over the fire pit. Just like making a peanut butter and jelly sandwich we stacked one graham cracker, a layer chocolate bar pieces and then next to it left the top graham cracker lonely but excited by the prospects of being squished on the top of our S’Mores snack. After a minute or so over the fire the marshmallow was carefully slid off its skewer onto the chocolate. The chocolate begins to melt which makes kids and adults alike smile and salivate with anticipation. Our once lonely graham cracker top is put into place and the Mantecado scoop is gently rested next to our masterpiece. What more could anyone ask for? I would like to say that is a pleasure to eat such an awesome ice cream. It is also a pleasure to be a part of its success. I see only fantastic things coming to the future of Valentini and everyone who is a part of it. Keep working hard and God Bless!!!!! !